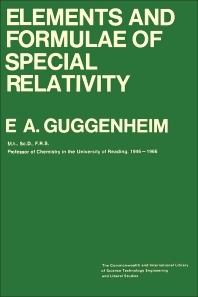 Elements and Formulae of Special Relativity presents elements and formulas of the theory of special relativity and covers topics ranging from kinematics and propagation of light to mechanics of single bodies, hydrodynamics, and thermodynamics. Vector operators, electromagnetic fields, electrodynamics, and statistical mechanics are also explored. This book is comprised of 13 chapters and begins by introducing the reader to the kinematics of special relativity, paying particular attention to formulas required for transformations between two frames of reference. Attention then turns to the propagation of light, the Doppler effect, the mechanics of single bodies, and the more general and more powerful approach to relativistic mechanics due to Lagrange and to Hamilton. The chapters that follow focus on formulas for a fluid maintained at a constant uniform pressure; relativistic formulas for thermodynamics; and representation of M-vectors with real components by cartesian 4-vectors with imaginary components. This book also considers the equations for an electromagnetic field in a vacuum and a gaseous phase composed of one or several perfect monatomic gases. A brief historical synopsis is given in the last chapter. This monograph will be useful to chemical physicists and other not-too-theoretical physicists.